I have to admit I never say this movie at the cinema, in fact I never heard of it until I saw it on the shelf for sale this week. After buying it I read up some of the reviews, and was surprised they were very mixed. I did read that Neil Armstrong sons supported the story told in the movie as accurate so that was good. That in itself made me think that it cant be that bad if it has the support of his family. Tonight I did watch it and thought it was very good, however I do wish the film makers used a tripod a lot more, and less of the hand held stuff. Overall I enjoyed it and would recommend it. If you are using a VP like I was, there is a change from the Scope ratio to a 70mm Imax ratio on the moon bit. This means a narrow picture width wise but a much larger image top to bottom so if you have your masking adjusted for scope the top and bottom will shoot of into your masking big time. I saw First Man Graham. I don't think I liked it as much as you did. I gave it 2.5 stars I too did not like all the hand-held camera shots. It just didn't seem to be necessary and at times very distracting. Shots with the camera following people walking through a house..down hallways...and into rooms may have given a realistic feel to the events, but for me it wasn't that interesting. I would have liked more story-line and dialog. 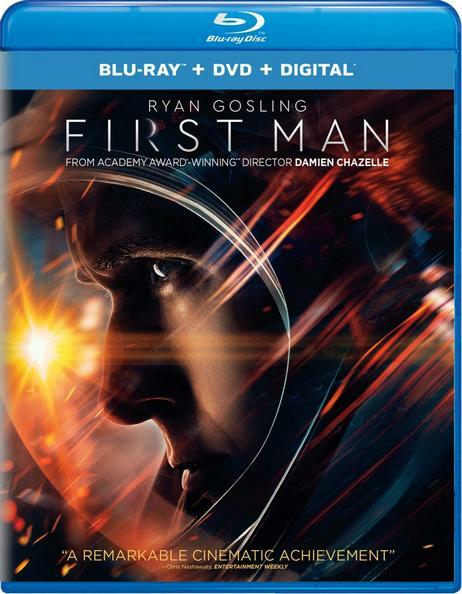 I love Ryan Gosling but I found it hard to connect with his portrayal of Neil Armstrong. I don't know if it was his acting or just the way the part was written. However I did like the scenes in space and the astronauts inside the capsules were really well done. I actually was getting claustrophobic watching them move around in such a tight space. I liked the music too ...just wish it had been a better movie. Ours showed up the other day and it's our show for tonight. When it came out theatrically we wanted to go see it, but never got around to it. We'll start out with "County Hospital" (Blackhawk via Elmo): a follow-up from seeing "Stan and Ollie" last Monday. We love movies like this: let's hope it lives up to "Apollo 13", "The Right Stuff" and "The Martian"! I watched the special features on the making of the movie today, and its certainly very impressive. One thing this film does do, is to show the human side to Neil Armstrong and his family. Up to watching this movie, all I knew about Neil Armstrong, was that he was the first man to walk on the moon and that's it, nothing about the man himself and the family tragedy that effected him, that occurred during the early part of his career. This film does give us an insight into one of the great achievements of our time and the huge risks involved in doing so. We saw it tonight and thought it was pretty good. What I liked is the portrayal of the Gemini program. It fills in a gap between The Right Stuff (Mercury) and Apollo 13 (Apollo). It's very emotionally intense. I guess it takes a kind of stoicism to go to work facing that level of risk. I count at least three times the man was nearly killed and his ability to keep calm is what brought him home. When I was a little kid I was very enraptured with the idea of being an Astronaut. When I grew up I was going to be Major Nelson. Sometimes I see what these guys really went through I start to think maybe I'd rather just marry Barbara Eden and leave it at that! Stan and Ollie completed their own "mission" just fine: there's just one less Model T Ford in the world now!